It’s easy to grow, adds a strong architectural look to the home and cleans the air, and the name is Sansevieria trifasciata or ‘Snake Plant. They grow well indoors and if you happen to be going away for a few weeks, they will survive without you. As for drought, low light and insect pests, they are just as hardy as the Aspidistra and the known as the cast iron plant. 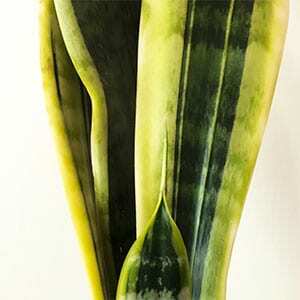 This isn just one of a number of many Sansevieria varieties available for sale. How to Grow the Snake Plant. This is a plant that requires excellent drainage, so use an open free draining growing medium. Plant in a container not much larger than the rootball of the plant itself. Use an open free draining potting soil or compost. Water well once after planting. Do not water again until the growing medium is dry. Fertilise in spring with a slow release fertiliser. Wait until the plant needs watering, fertilise and water in well. Keep the plant in bright filtered light for best results. Fertilise with a general purpose slow release fertiliser in spring, a 6 month type will do. You do not need to fertilise twice a year. In terms of light, these plants will grow in full sun or part shade, try for 6 hours of good filtered light a day as a minimum. This is the most important care factor. As a rule you will only need to water once every 6 weeks, although this depends on where you are growing it. In a warm heated position indoors, you may need to water every 3 weeks as the heating drys the air and the soil. Always allow the soil to dry between watering and never let the plant sit in a saucer of water. They are best grown in filtered or indirect light, full sun can cause leaf burn. In very dark lighting the foliage can begin to go pale in colour. Watering should be kept to a minimum. Overwatering can cause the leaves to go floppy or fall over. On the other hand, a lack of water will eventually cause the leaves to turn yellow. If the plant is over watered it can usually be saved. You need to remove the plant from the potting soil and remove the soil from the roots. Any parts of the root system that are rotting need to be cut away. Leave the plant in a dry position overnight to allow the roots and stem to dry. Repot in a free draining potting mix that is fairly dry and do not water in. You can divide the plant in spring, you will see the offsets and these can be easily removed and repotted. It is also possible to propagate the plant from leaf cuttings which will strike in either water or compost mix.